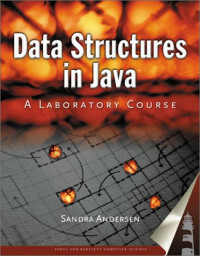 Data Structures in Java: A Laboratory Course defines active learning. With sixteen labs to choose from, this laboratory manual creates a "learn by doing" experience for its students by engaging them in implementation of data structures and in application of algorithms. Students are challenged to exercise their knowledge in each of the four-part structure laboratory assignments: Prelab: Students use the Prelab assignments to explore and implement the basic operations of a data structure. Bridge: During the Bridge exercises, students test and debug the advanced data types they developed in the prelab and are provided with substantial feedback and support. In-lab: Students gain programming experience during the in-lab projects as they apply the data structure to a real-world problem. Postlab: Following their lab class, students analyze and validate the efficiency or utility of the data structure in the Postlab exercise. ADT Implementation: The laboratories are designed to complement a variety of approaches to implementing each ADT. All ADT definitions stress the use of data abstraction and generic data elements. As a result, you can adapt them with minimal effort to suit different implementation strategies. For each ADT, class definitions that frame an implementation of the ADT are given as part of the corresponding Prelab exercise. This definition framework is also used in the visualization method that accompanies the laboratory. Should you elect to adopt a somewhat different implementation strategy, you need only make minor changes to the data members in the class definitions and corresponding modifications to the visualization routine. You do not need to change anything else in either the supplied software or the laboratory text itself. Defines active learning. With 16 labs to choose from, this lab manual creates a 'learn by doing' experience for its students by engaging them in implementation of data structures and in application of algorithms. Each laboratory consists of four parts: Prelab, Bridge, In-lab, and Postlab. The Prelab is a homework assignment in which you create an implementation of a data structure using the techniques that your instructor presents in lecture, along with material from your textbook. In the Bridge exercise, you test and debug the software you developed in the Prelab. The In-lab phase consists of three exercises. The Þrst two exercises apply or extend the concepts introduced in the Prelab. In the third exercise, you apply the data structure you created in the Prelab to the solution of a problem. The last part of each laboratory, the Postlab, is a homework assignment in which you analyze a data structure in terms of its efÞciency or use. Your instructor will specify which exercises you need to complete for each laboratory. Be sure to check whether your instructor wants you to complete the Bridge exercise prior to your lab period or during lab. Use the cover sheet provided with the laboratory to keep track of the exercises you have been assigned.